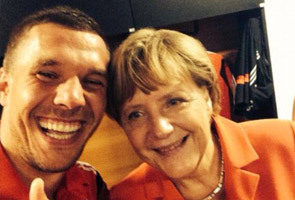 German striker Lukas Podolski takes a selfie with Chancellor Angela Merkel following Germany's 4-0 win over Portugal. SAO PAULO: Click. Brazilian football star Neymar poses shirtless with his girlfriend. Click. German forward Lukas Podolski has his arm around Chancellor Angela Merkel in a stadium locker room. Anybody armed with a smartphone seems to be taking selfies at the World Cup in Brazil, with fans and players posting their souvenirs online for all to see. Thanks to the proliferation of smartphones, millions of messages and pictures have been posted on social networks during the tournament, which started June 12 and ends July 13. The number of handheld devices with broadband Internet access has soared globally since the 2010 World Cup in South Africa, from 800 million four years ago to 2.5 billion in 2013, according to the GSMA association of mobile operators. Some three million Brazilians and 600,000 foreigners are attending the World Cup's 64 games, snapping pictures across the vast South American nation. "It is very tempting for human beings to feel recognized, and the Internet is a powerful communications tool," said Rosa Maria Farah, an expert at the Catholic University of Sao Paulo's Information and Psychology Research Center. "Selfies don't depend on publicity agencies. It is the individual himself who communicates," which makes the message "much more intense," Farah told AFP. Neymar, the 22-year-old striker with a model girlfriend, regularly shares personal pictures on social media. More than one million people clicked on "like" when he uploaded a selfie on the photo-sharing website Instagram showing his girlfriend resting her hands on his bare shoulder. He posted the snapshot after scoring two goals in his team's 3-1 defeat of Croatia on June 12, which coincided with Brazil's version of Valentine's Day. Podolski posted his selfie with Merkel, who is a big fan of the football team, after she visited the locker room following Germany's 4-0 trouncing of Portugal during the tournament's group phase. Some teams, like Portugal and Mexico, took group selfies with their countries' respective presidents before the World Cup. Real Madrid star Cristiano Ronaldo shared the team's photo with Portuguese President Anibal Cavaco Silva on Twitter, getting more than 14,000 retweets while 17,000 users "favorited" it. Argentina and Manchester City forward Sergio Aguero has published for his six million Twitter followers several selfies he took with his famous teammates during the World Cup. For some, the selfie craze continues even after the World Cup. After being eliminated by Brazil on Saturday, the Chilean team was invited to President Michelle Bachelet's palace. "Now that's a selfie!" wrote defender Gary Medel, aka "Pitbull," in a picture of him with the bespectacled Bachelet. But it's not just the famous goal-scorers who are immortalizing their World Cup experience. Countless fans have taken selfies across the 12 cities hosting World Cup games: on their way to the stadiums, in the stands, at street screenings and at the bars. In Rio de Janeiro, one spot became a fan favorite to take a self-portrait: in front of an Adidas billboard featuring disgraced Uruguayan striker Luis Suarez with his mouth roaring open. Hundreds of people took shots with their shoulder placed between Suarez's teeth, reenacting the player's infamous bite against Italian defender Giorgio Chiellini, which led to his expulsion from the tournament. From the first game at each of the 12 stadiums, a combined total of 7.6 million emails, pictures or multimedia messages were sent, according to official figures. The government says 3G, 4G and wi-fi connections are available at all the stadiums, though AFP journalists said data services or calls did not always go through at all the arenas. In the group phase of the World Cup, some 300 million messages related to the tournament were sent on Twitter. Facebook said Monday that the World Cup has kicked up more action at the leading social network than any other event in its history. More than one billion comments, posts, and "likes" related to World Cup matches have been racked up since the tournament began, in a level of online conversation never seen before on the site, according to the California-based social network. About 220 million people have taken part in the unprecedented online conversation.